May day is typically the time of year to celebrate the beginning of spring, but this year in Los Angeles, it marked tense protests and confrontation. Although the protests were associated with the “Occupy Movement”, they did not focus on income tax or the media, they were centered on immigration reform. The LA Times reported that the demonstrations could have grown dangerous but remained peaceful. As the crowd grew, tensions rose and the crowd appeared to be encircling police officers. The crowd calmed down as more police arrived and no serious injuries have been reported. There was one police officer who got hit on the head with a skateboard, but the blow merely dented her helmet. Until this tense moment, the crowds had been mostly jovial and harmless. Overall, however, the rally was peaceful and the demonstrators voiced their opinions without causing trouble. The movement in LA has gained some support from California Assembly Speaker Fabian Nunez. Nunez decried raids on businesses that intend to find undocumented workers, arguing that it is both unfair, and needlessly puts the economy at risk. 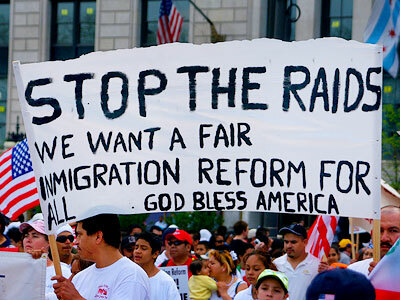 Although he does not support illegal immigration, he believes that these raids discriminate people based on appearance, and that it would be more effective to target the unemployed. Needless to say, having proper legal representation is crucial for people being accused by the Immigration and customs enforcement agency.